This image made available on Aug. 1, 2018, by the Swedish Police shows a collection of Swedish Crown jewels. 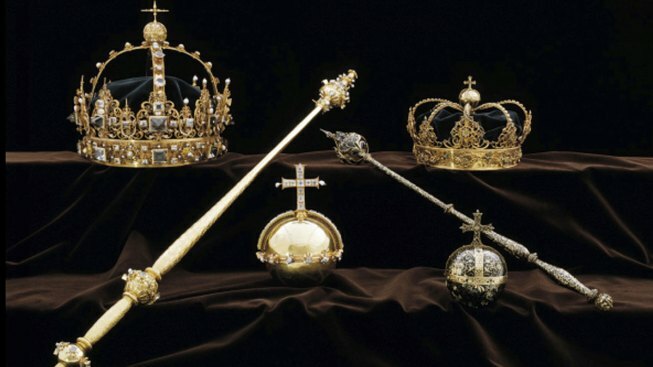 police Tuesday, Feb. 5, 2019, that at least some crown jewels, stolen in July, were recovered in a suburb of Stockholm. Sweden's crown jewels, stolen this summer in a Hollywood-style heist involving a speedboat, have been found on top of a trash can in a suburb of the capital, Stockholm, NBC News reported. Swedish police say "every indication" suggests the 17th-century crowns and a royal orb have been located months after the the raid on Strängnäs Cathedral. "The police are working intensively to have it confirmed 100 percent," officers said in a statement. A security guard found the jewels, though police didn't say if both the crowns and the orb were among the recovered items. They were stolen in July from alarmed displays and the thieves are believed to have escaped over a network of lakes. A man is on trial for the heist.